Many high-end collectors are also gun lovers, delighting in the craftsmanship and attention to detail of a high-end firearm. 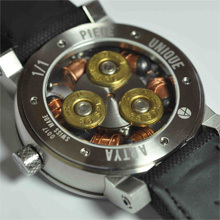 To celebrate this slightly strange marriage between Swiss high watchmaking and firearms, Yvan Arpa for ArtyA introduces the Son of a Gun Watch. A collector has ordered this exceptional timepiece from Yvan Arpa, creator and consultant in high watchmaking for his brand ArtyA. 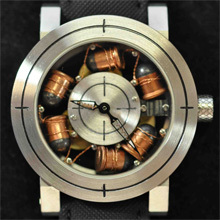 To debut the collection Artya has imagined a watch containing real bullets. 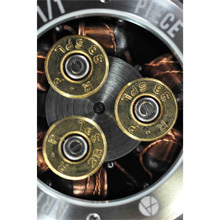 With a bezel and inner dial like a target sight, the piece showcases six 6mm Flobert bullets suspended in the dial almost like the barrel of a revolver. Use of copper wire like dynamite wire and the iconic 47mm wide steel case display Artya brand DNA.